Get full details about this IT Contract Negotiation training sent to your email immediately after you enter your contact details on the right. Many negotiation courses address the topic in a general light or focus on negotiation as a sales tool without much focus on contracts & procurement. This workshop however, is specifically focused upon the IT and Outsourcing commercial relationship negotiation interface. You will learn how to become an effective negotiator in the context of a commercial contract - you will realize that negotiation is not merely an event, but rather an inter-related phase in a larger process. How can you best prepare for negotiations with IT/Outsourcing commercial partners? Why are internal negotiations with stakeholders sometimes tougher than negotiating with external commercial partners? Develop effective negotiation strategies for your contracts in the IT/Outsourcing sector! Assign effective roles to negotiation team members! How to create negotiation strategies that enable greater value and risk positions? Identify negotiation tools that are needed for negotiation success in the IT/Outsourcing sector! 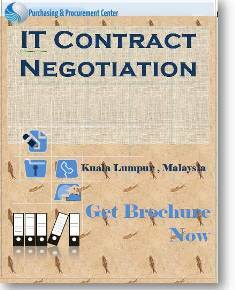 Get full details about this IT Contract Negotiation sent to your email immediately after you enter your contact details on the right. BONUS. You will also receive as a Bonus a Free Subscription to Purchasing & Procurement's Center "Weekly Purchasing Tips", that show you how to run and manage better your purchasing & procurement functions. If this is not the exact seminar you are looking for, click here to find out more purchasing procurement seminar.